Enjoy magnificent views of the Bridger Mountains. 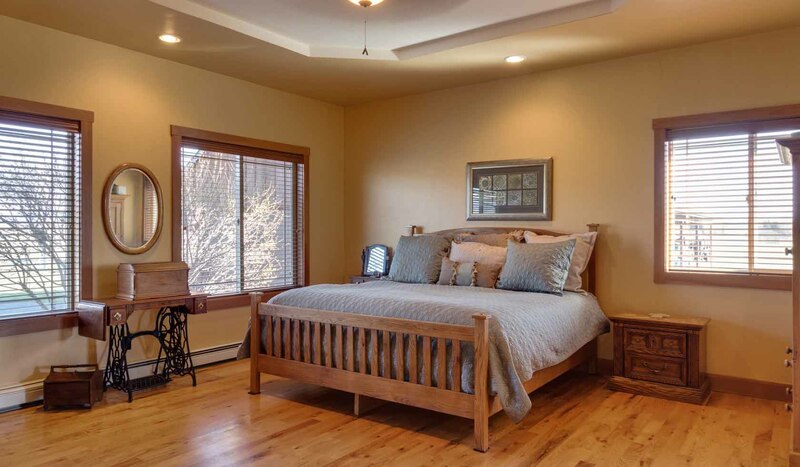 Located just minutes from downtown Bozeman, Belgrade and the airport. Relax in the hot tub after a long day of adventuring, play a game of pool or sit around the fire pit. The home has wireless Internet and satellite TV. Brief Description: Great four bedroom home with an open concept and lots of space, that sits on a large lot with stunning views of the Bridger Mountain Range. Mountain View will accommodate 8 guests in four bedrooms, and your four-legged canine companions will also be considered! Just minutes from the home you'll find yourself in downtown Bozeman or on the banks of the East Gallatin River. Enjoy the great outdoors, then return to a comfortable home with a private hot tub, fire pit and game room! Bedrooms and Baths: The home has four bedrooms and three bathrooms. The master suite has a king size bed, en suite bathroom with a walk-in shower, soaking tub and access to the patio and hot tub. The second bedroom on the main floor has a queen size bed and access to the guest bathroom upstairs. There are two additional bedrooms downstairs; one with a queen bed and the other will a double bed. The third bathroom is also located downstairs. Kitchen: Make yourself at home in this fully equipped, recently remodeled and spacious kitchen with stainless steel appliances. The kitchen is a cook's dream, with a gas range, double ovens, lots of counter space, including an island and breakfast bar, and a french door refrigerator. Dining Room: The dining area is open to the kitchen and living room, making it an ideal space for entertaining. You can also enjoy your meals outside on the patio or on the covered front deck. Living Room: The living room is comfortable and cozy, with tasteful furnishings, fireplace and a large flatscreen TV with satellite service and a DVD player. There is also a large office on the main level, providing a great space for those needing to work. Wi-Fi is provided. Game Room: The game room is sure to be a popular spot as it features a pool table and another large flatscreen TV with satellite service and a DVD player. Outdoor Amenities: This home has plenty of outdoor space with a large, covered front porch and a great patio on the side of the home. There is a gas grill, outdoor seating, a hot tub, fire pit, horse shoe pit and bocce ball. Setting, acreage, views: From the home you have an incredible view of the beautiful mountain ranges surrounding you. The home is located in a peaceful neighborhood between Bozeman and Belgrade off of a cul-de-sac. Activities nearby: Explore the towns of Bozeman and Belgrade, both a short drive from the home. Fish one of the many amazing rivers, visit Yellowstone National Park, and enjoy endless opportunities to hike, mountain bike and more. Ski at Bridger Bowl or Big Sky in the winter. For an especially memorable experience in the park, book a specialized private tour with our sister company, Greater Yellowstone Guides. Distance to town and airport: The home is located only five to ten minutes from The Bozeman Yellowstone Airport and ten minutes to Bozeman. Only thirty minutes to world class skiing at Bridger Bowl, an hour to Big Sky and two hours to Yellowstone National Park.